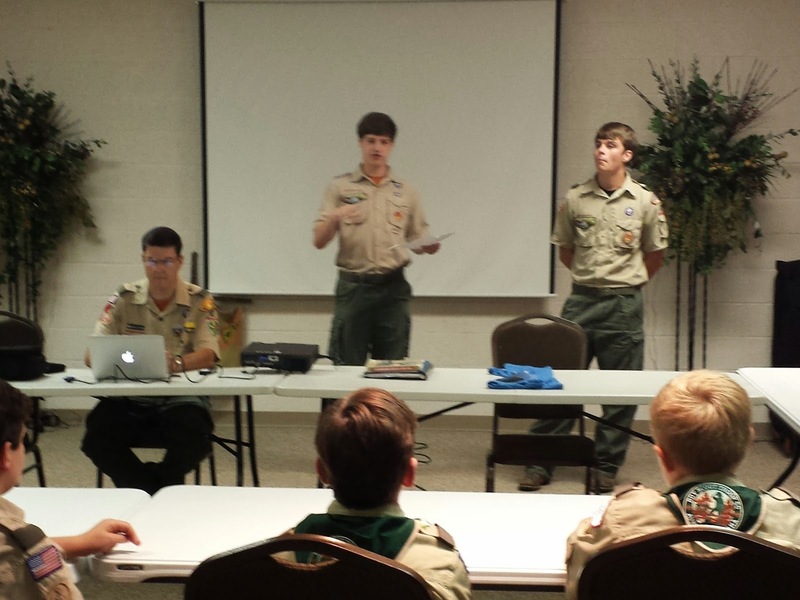 Boy Scout Troop 50 | Chattahoochee Council | Auburn, Ala. | #troop50: What did you do this summer? At the troop's Aug. 18 Monday-evening meeting, many members of the troop recounted their Scouting adventures from Summer 2014. First on the evening's agenda were Junior Assistant Scoutmaster Ethan and Assistant Senior Patrol Leader Davis, who along with Assistant Scoutmaster Jason Smith, headed to North Carolina for the "Five Rivers in Five Days" high-adventure experience at Camp Daniel Boone. Davis and Ethan shared about the various rivers and rafting challenges the three of them enjoyed during the week and recommended the trip to other Scouts for future summers. 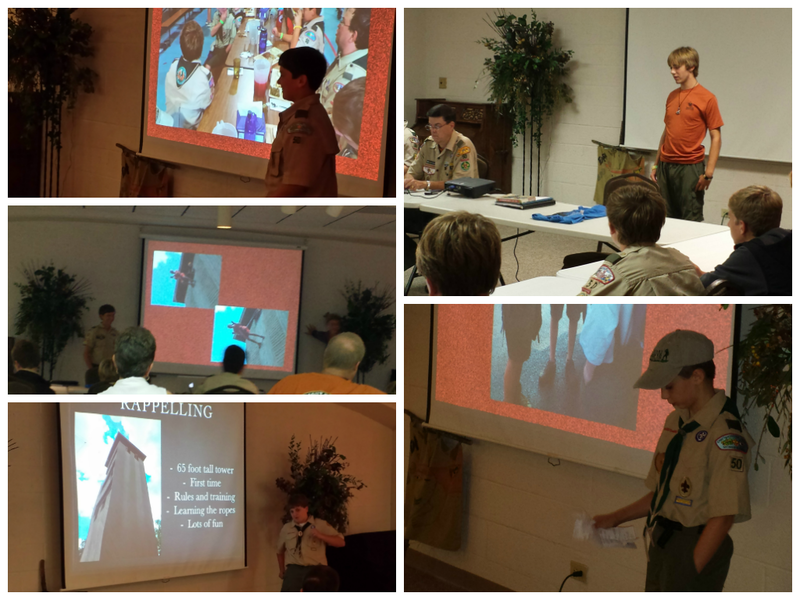 The remainder of the evening's presentations focused on the troop's primary summer camp expedition to Camp Woodruff. The troop's senior and newest Scouts alike gave Camp Woodruff high marks for advancement and extracurricular camp activities. From the first-year Mountain Man program to dining hall menus to "bonus" activities like rappelling and whitewater rafting, the overall sentiment was that everyone had a great time. 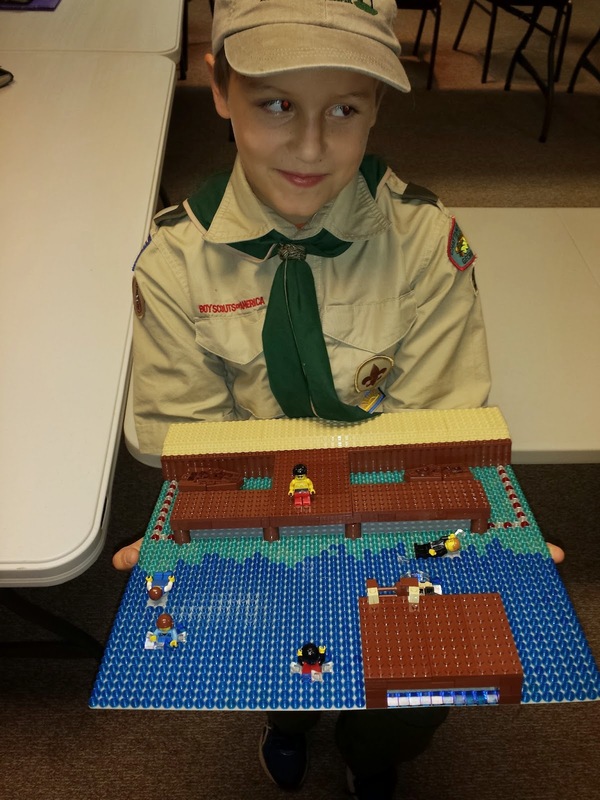 Joe, one of the troop's newest Scouts, had such a great time at the camp's waterfront that he made a special Lego-focused diorama featuring his experiences to include in his presentation. Following the summer camp presentations, Scouts split up into their respective patrols. The troop will reconvene Sunday at Chewacla State Park for its end-of-summer court of honor and swimming outing. Next Monday's meeting will be a working meeting and will include a reorganization of the troop's trailer to ready for the fall camping season.